On a typical day, 22.7 percent of Americans get their breakfast from a fast-food outlet. At lunchtime, 43.7 percent of Americans pick up a quick meal, and 42 percent do the same for dinner. Another 22.8 percent get a snack from a fast-food joint. 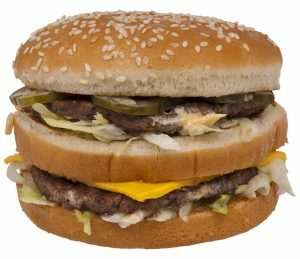 (Clearly, many Americans are eating fast food more than once per day.) Nearly half of American men — 48.3 percent — eat fast food for lunch on any given day. That’s significantly more than the 39.1% of women who do the same. On the other hand, about 1 in 4 women (25.7 percent) treat themselves to a fast-food snack on a typical day, compared with 1 in 5 men (19.5 percent). Here’s one of the surprises of the CDC data: It isn’t, as is often believed, mostly poor folks who eat fast meals. The more income diners had, the higher likelihood that they were doing so, with 42 percent of high-income families reporting they had fast food on a given day. The crunch for time rather than cost drove bad eating, researchers said. Their work, however, had its strengths and limits. On the positive side, trained researchers, rather than relying on written surveys, interviewed study participants, and asked about recent eating, not meals from months ago. But they also did not detail the exact foods study participants ate, instead, asking only about “the source where they obtained those items. Food reported as ‘restaurant fast food/pizza’ was considered fast food” for this study. Still, the CDC and other nutrition experts long have warned that, as CNN reported, “fast food is typically higher in unhealthy saturated fat, sodium and calories [and] it tends to be low in several key nutrients that adult bodies need to flourish, and that children’s bodies need to grow.” Have we forgotten Morgan Spurlock’s documentary, Super Size Me? Race and ethnicity matter in fast eating: It’s most popular “among African Americans, 42.4 percent of whom ate it on a typical day. It was the least enticing to Asian Americans, though 30.6 percent of them ate it on a typical day as well. In between were whites (37.8 percent) and Latinos (36.5 percent),” the Los Angeles Times reported. The pernicious effects of a fast and poor diet — especially eating “Southern” with lots of fried foods, organ meats and processed meats, dairy, sugar-sweetened beverages and bread — leads to higher rates of high blood pressure, heart disease, and reductions in life expectancy for African Americans, NPR reported, based on research separate from the CDC’s. In my practice, I see the harms that patients suffer while seeking medical services, and the value in their staying away from doctors, hospitals, nursing homes, and institutional care or treatment where, research shows, damaging medical errors have become far too common. Medical errors claim the lives of roughly 685 Americans per day — more people than die of respiratory disease, accidents, stroke and Alzheimer’s. That estimate comes from a team of researchers led by a professor of surgery at Johns Hopkins. It means medical errors rank as the third leading cause of death in the U.S., behind only heart disease and cancer. Although Americans obsess over fad diets that change by the second, common sense and moderation matter a lot when it comes to eating, research shows. We all can benefit by cutting back on added sugar, refined grains and highly processed foods, and concentrating on eating plenty of vegetables and whole foods — without worrying about counting calories or limiting portion sizes. Reduce the salt intake, hold off on the red meat, and eat more fish and nuts. People stay healthier, too, if they moderate their drinking, don’t smoke, and exercise — even a little. It is funny, when we see news clips of a shark swimming near a beach, it scares us into not going near that beach. However, what we should be scared of is double cheeseburgers, French fries, and large amounts of sugary beverages. Adults can go to the grocery store more and prep food to take on the go so we don’t have to get in a situation where we need to rely on fast food so much. It takes time and some organization. I see many people who are successful at this, though, when they take a couple of hours on the weekend, and again midweek, to prep food and then plan ahead just a little to take some things with them.